It was in October of 2016 that I came across a Pakistani Parliament (Senate) committee report on the “Policy guidelines in the view of the latest situation developing between India and Pakistan”. It is seldom that I find myself at a loss for words. I did that day, partly because I was amused at the juvenile ranting in that committee report which sounded like the members were a bunch of enraged 15-year-olds angry about India stealing their cookie, and partly because as I read along, I realised that Pakistan had decided to fight the war through a fifth column in India, and it appeared to be winning. A fifth column is basically any group of people who undermine a larger group – such as a nation – from within, usually in favour of an enemy group. The committee report of the Pakistan senate juxtaposed with the narrative being set at home suggests that it’s happening exactly the way Pakistan wanted. No Balochistan please – Pakistan’s wish is command for? So Pakistan does not want India to talk about Balochistan. Coincidentally, the same “suggestion” was given to Modi by many. Starting from opposition members like Salman Khurshid and many journalists who turned into foreign affairs experts in a matter of minutes. Strange coincidence that what irks Pakistan has irked the commentariat in India. Pakistan wants no discussion around Balochistan, the Indian commentariat also argues against it. Narrative that Pakistan wants. Where have you read the same? The media’s and oppositions support to elements like Umar Khalid and his entourage screaming “Aazadi” slogans directly helps Pakistan in building its narrative of “Kashmir’s right to self-determination”. I am reminded of a speech made by Umar Khalid, in which he says that freedom in India is not possible without supporting the aspirations of the people for self-determination which can also mean “freedom from India”. It is indeed reductionist to call these elements merely “ant-national”. They seem to be a part of Pakistan’s vital fifth column against India. When Pakistan talks about “highest population to soldier ratio”, I am reminded of all the home-grown articles that peddled the dangerous narrative of revoking AFSPA, all of which didn’t fail to remind us of this ratio. “Prisoners and wounded have certain rights” they say. Firstly, it’s quite rich when it comes from a country that is not only responsible for generations being wiped out in Balochistan, but also systematic elimination of minorities in Pakistan. Secondly, I am reminded of all those endless debates about pellet guns that were “blinding and wounding innocent civilians”. I wonder then, is Pakistan’s fifth column here in India helping Pakistan build baseless “atrocity literature”? “Pakistan will pull troops employed to fight war against terror” sound laughable, but it is indirect threat to USA, whom Pakistan has been fooling by pretending to fight against terror and extracting millions of dollars in return. To make this fake fight against terror appear real, Pakistan needs a narrative that it is also a “victim of terrorism”. How many times have you heard that? And from whom? The fifth and last part is even more laughable, but sinister. Pakistan would clearly not talk of Islamic radicalisation taking place in Kashmir, which is being actively orchestrated by Pakistan and people who follow their ideology of Islamofascim and two-nation theory. Their case is helped if one ignores role of Pakistan and the Islamist ideology and something else is peddled as the reason of “radicalisation of Kashmir youth”. This is exactly what is being peddled through strings of op-eds being churned out. In one such article, JNU professor Kamal Mitra Chenoy blames the Indian state, the Armed forces and everything other than Pakistan or the radical Islam, over why the unrest refuses to die down. It would have been deeply laughable if not so tragic and sinister when Ram Guha, who is presented as erudite historian in our television shows, goes on to blame Dadri incident for violence and radicalisation in Kashmir. 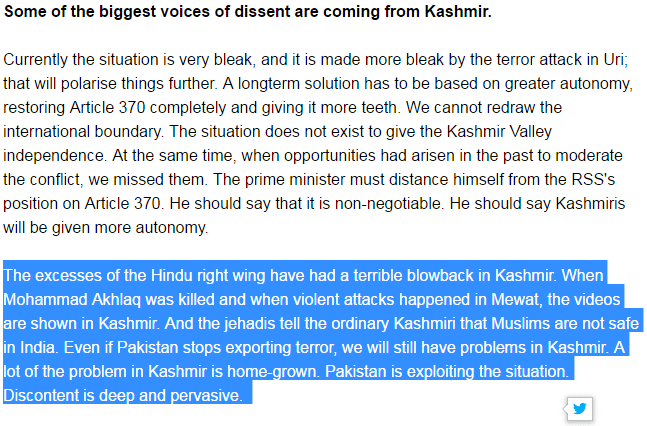 Entire Kashmir problem is blamed on Hindu Right Wing, and Ram Guha says that “even if Pakistan stops exporting terror, we will still have problems in Kashmir”. Now go back to the fifth point in Pakistan’s Kashmir narrative. Alternative history by Ram Guha. Subtle way of saying, Pakistan is not responsible. Maybe Ram Guha is not a historian but a sci-fi writer who thinks Jihadists, who massacred Hindus in 1990s and carried out ethnic cleansing of the Kashmir valley, had time traveled to post-Modi India to record some videos. You see – it is the Modi government that is the culprit. We are being told to believe that “Pakistan is not ravening at the mouth to swallow Kashmir”. As was pointed out by an article on OpIndia.com earlier, this narrative is the most pernicious and sinister, as it builds a Pakistan-friendly ground for another partition of India. It gives clean chit to Pakistan and Islamism. Pakistan’s strategy to divide India by exploiting the fault lines. I think enough has been said about how the Media and the politicians dangerously played with national security and peace, when they notoriously played up not only law and order issues in a communal manner, but sometimes created communal angles from thin air where none existed. An article by Mr. Ashutosh Muglikar had analysed it way back in 2016. To Pakistan’s dismay, most of the propaganda via their fifth column didn’t have long term impacts. I imagine the frustration of failing to spark unrest in India was immense, and in a last ditch effort, Pakistan turned to try the same tricks on the Armed forces, the last bastion standing, untouched by fault lines. The fifth column has been perhaps trying its best to divide the Indian Army on two plants. One, by ensuring that the citizenry start doubting achievements of the Armed Forces, and second, by dividing the Armed Forces from within. Attempts to divide the Armed Forces is not new. But it has gained a feverish pitch in the last two years. From aspersions cast on the Armed Forces during the “terror boat” incident, to asking the Armed forces to provide proof of surgical strikes. From creating atrocity literature about “Indian army excesses” to peddling the line that the Armed Forces are fallible and deserve to be questioned. From using the “but our soldiers are fighting at the border” mockingly to saying “our soldiers signed up to die”. We even heard journalists declare a soldier a “deserter” who crossed over to Pakistan due to “grievances”. Reality was that he had inadvertently stepped over and now back in India. Irresponsible reporting based on a WhatsApp forward most likely a Pakistani propaganda. We recently saw a hideous case of criminal negligence by a portal called The Quint where they carried out a sting operation on an unsuspecting Jawan that lead to his suicide. A coordinated effort to create dissent among the Jawans by playing up the Sahayak system as an evil construct. There seems to be a systematic attempt to demoralise the Armed Forces and shake the citizen’s confidence in them thereby dragging the professional ethical institution of the Indian Armed Forces to the same level as that of the Pakistani army. Congress had to tried to once divide the Army on religious lines by calling for the religious census of the Armed Forces which was thankfully thwarted. A renewed effort seems to be taking steam. We read endless articles about the travesty of Muslim soldiers not being allowed to keep a beard. The myths of the same were dismantled here, but not before it became a national narrative of communalism in the Armed Forces. There was also an incident where “Cobrapost” used a 5 year old video to demonise the Indian Army. I could go on listing the numerous incidents where our home grown fifth column has tried to not only politicise but also demonise the Indian Army. It is therefore evident that the hybrid warfare has now turned to creating fault lines within the Armed Forces having failed to divide the nation on such lines. It is thus unmistakable that India has entered a phase of composite warfare where risks to our sovereignty and peace don’t only come from external aggression at the border or by proxy war sponsored by enemy nation, but by activating elements in India who either work for Pakistan or sympathise with their “cause”. The senate report even ended with the emphasis to restart “track 2” talks which historically undermines the authority of the elected government and their actions. The war, has reached the doorstep of every citizen. The government, Armed forces and intelligence agencies are not the only key members in this tussle. Every Indian is. It is therefore incumbent upon the citizens to differentiate between news and propaganda. To resist the urge to be sucked into the “aman fairytale” that might sound fantastical, but is perhaps the most potent weapon to weaken India’s resolve. If we don’t wake up, we will lose this war. And then finally that placard will make sense – Pakistan didn’t … War did.